Study abroad is increasing in popularity. According to Open Doors®, published annually by the Institute of International Education in partnership with the U.S. Department of State's Bureau of Educational and Cultural Affairs, the overall number of Americans studying abroad for credit has more than doubled in 15 years. In 2001-02 there were 160,920 U.S. students who studied abroad; and in 2016-17, there were 332,727. According to OECD's Education at a Glance 2016 report, the number of foreign students enrolled in tertiary education programs worldwide has exploded over the past two decades. It rose from 2 million in 1999 to 5 million in 2016. A study abroad experience is becoming increasingly essential. This remarkable expansion stems from the growing awareness that traveling to other countries, becoming exposed to other cultures and learning another language have a great impact on an individual's life. Studying abroad helps gain confidence, independence and leadership skills as well as develop new interests. The internationalization of labor markets for highly skilled people, has given students an incentive to gain international experience as part of their higher education. 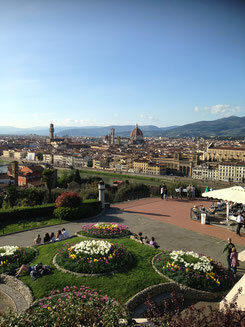 A study abroad program sets your college apart. Research found by the American Council on Education and Mapping Internationalization on U.S. Campuses discovered that in 2012 only 54% of the surveyed U.S. higher education institutions administered undergraduate study abroad programs for credit in the academic year 2010-11 and that 60% did not have a full-time administrator overseeing or coordinating multiple internationalization activities or programs. The same study found that 42% of the U.S. higher education institutions surveyed had not sent any of their undergraduate students abroad and 36% had sent less than 5% abroad. Even if U.S. study abroad has increased dramatically over the past two decades, the majority of Americans still graduate from college without ever having studied abroad. Benedictine College's Florence semester program, approaching its 13 year anniversary this fall, has earned a 4.7-star rating on studyabroad101.com. Several stated they felt more marketable, independent and comfortable in foreign environments. Additionally, many stated they felt confident in their travel abilities after having studied abroad. The National Survey of Student Engagement shows that Benedictine College students study abroad at a statistically significantly higher rate than students at their peer institutions.